Duckie Blog Awards: Unrest, Violence and Nukes, Oh My! Blogs dealing with political unrest, global violence and nuclear weapons were awarded as among the best in the English-speaking international studies community last Friday. 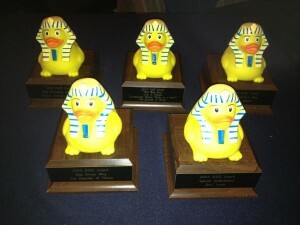 The annual Online Achievement in International Studies awards, dubbed the Duckies, are a product of the Duck of Minerva world politics blog and supported by SAGE (the parent of Social Science Space); they were presented during the International Studies Association annual convention in Toronto. Taking home the most Duckies was the blog Political Violence @ A Glance, which was named best group blog and had two of its contributors’ articles named as best individual posts of 2013. The brainchild of Barbara F. Walter and Erica Chenoweth, political scientists at the of California, San Diego and University of Denver respectively, the blog offers “expert analysis on violence and Its alternative.” At last year’s Duckies, it was named the most promising new blog. Political Violence’s winning post was Christian Davenport’s “Researching While Black: Why Conflict Research Needs More African Americans (Maybe),” while Barbara Walter’s “The 4 Things We Know About How Civil Wars End (And What This Tells Us About Syria)” received runner-up honors. The runner-up in the Best Group Blog category was The Monkey Cage, which the Washington Post now hosts. Dart Throwing Chimp, last year’s runner-up in the category, was named best blog with a single contributor. Chimp, with its tagline of “Thoughtful analysis or bloviation? Your call” is written by Jay Ulfelder, an American political scientist working as an independent consultant who theorizes and forecasts political development and instability in various forms. The runner-up for best individual blog was Stephen M. Walt. Judges picked Cheryl Rofer’s Nuclear Diner by as the most promising new blog. Rofer is a New Mexico-based chemist who writes on national security, nature, science, and women’s issues; Nuclear Diner runs the gamut of atomic issues including power, weaponry, and waste. The runner-up as best new blog is the Center for International Maritime Safety’s Next War Blog. A special achievement prize, awarded to the blogger who has made the most outstanding contribution to international studies blogging, went to last year’s best individual blog winner, Daniel Drezner. A professor of international politics at the Fletcher School of Law and Diplomacy at Tufts University, Drezner is a fellow at the Brookings Institution and a contributing editor at Foreign Policy. During the Duckies reception he said he would be blogging soon on a platform with a “larger megaphone” than Foreign Policy. The winners of this year’s awards were selected from a reader-determined shortlist by a panel of judges that included last year’s winners and permanent contributors to the Duck of Minerva blog; Duck of Minerva personnel are excluded from consideration for the prize. Details on last year’s winners and the full shortlist for the this year’s awards can be found here and here respectively. This entry was posted in Recognition and tagged Academic Blogging, Duck of Minerva, international studies. Bookmark the permalink. Trackbacks are closed, but you can post a comment.